Aside from the finish line, miles 15 and 16 of the Richmond Marathon have always been the most memorable part of the race for me. In prior years, I found this stretch of race – a long, gradual incline on Lee Bridge – to be the most grueling and challenging. At one point a few years ago, the wind felt so strong, I was convinced that I was jogging in place and not actually making any forward progress. However, during this year’s marathon, my memories of this portion of the race are different and thankfully much more positive. In fact, my entire experience in Richmond this fall was markedly better and faster than past races. I attribute this success to Formula. Starting in early August, I began following a Richmond marathon training plan that Ann developed for me. The core of the program involved consistently taking two Equilibrium classes throughout the week. In given weeks, I would also incorporate a Focus class. I rounded out my training with longer runs on the weekend; and, on some Saturdays or Sundays, I would follow a specific outdoor workout that Ann outlined. 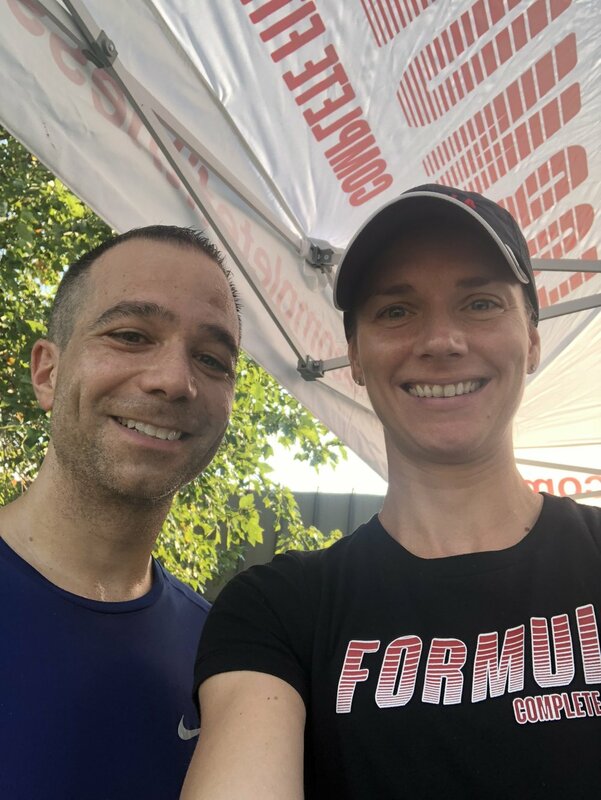 In comparing Formula’s approach with past marathon training plans, I found that my overall mileage remained relatively consistent; however, Formula’s focus on speed work, strength training, running efficiency, and overall mechanics made all the difference for me. Both the Equilibrium and Focus classes challenged me in new ways and I began approaching my training with a new-found excitement and discipline. Likewise, the classes increased my overall strength. This boost, in turn, improved all aspects of my fitness – in getting stronger, my running form improved and I experienced measurable gains in speed and endurance. Mike and Ann celebrating Mike’s speedy Pepsi 10K in September. I began to feel the impact of Formula early in my training. In racing in a 10K and 5K in the fall, I surprised myself with faster than anticipated times. With both races and subsequent long runs, I found that I felt stronger and my legs felt lighter and quicker with each mile. After each of these runs, I also recovered quicker than in the past. The combination of running on the Woodways and incorporating strength training seemed to fast-track my recovery after these races and long runs. Just as important, as a result of this training at Formula, a lingering and longstanding pain in my Achilles all but disappeared. Running Richmond this fall was a culmination of my Formula training experience to date. At the starting line, I felt confident – both physically and mentally – that my Formula journey would translate into a successful race. I maintained these feelings throughout the marathon, especially as I crossed the bridge at mile 16. When I crossed the finish line, I was thrilled to see 2:52 on the clock – an improvement of 12 minutes from the last time I ran Richmond (2016) and within three minutes of my PR from several years ago. I’m grateful to the entire Formula Team for contributing to this success!